Finding a trusted automobile mechanic has long been a challenging ordeal. Consumers have depended upon word-of-mouth referrals, yellow pages advertising, and even simple drive-by convenience to find a mechanic to service their auto. When faced with inefficient options like these, it’s no surprise that consumers often think of the process of finding a mechanic to be a frustrating, hit-or-miss affair. Helping to ease that process is the reason ClickMechanic, a UK service provider, has found success building its marketplace platform to match thousands of customers with trusted professional mechanics every month. ClickMechanic was founded in 2012 on the simple premise that finding a trustworthy mechanic to work on a vehicle is often more difficult than it should be. The service takes the stress out of the transaction by asking customers to simply register their vehicles, select the work that needs to be done (or ask for a diagnostic evaluation), approve an industry standard-approved quote, and confirm their booking. On the other side of the transaction, ClickMechanic only works with mechanics who meet certain criteria. The company’s system ensures that the best-performing service providers are rewarded with a steady stream of repair jobs, and a 12-month warranty on labor and parts gives customers and mechanics peace of mind. 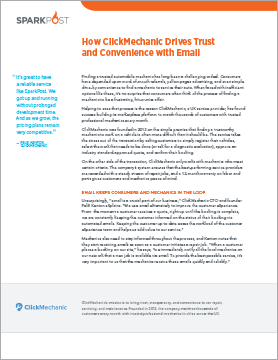 Kenton also says that SparkPost has helped ClickMechanic meet their the mission-critical requirement that emails reach customers and mechanics as quickly as possible. “The most important thing for us is deliverability, which so far has been excellent,” he points out. The SparkPost dashboard also gives ClickMechanic an easy way to see email sending metrics and figure out if they’re running into any bottlenecks. That’s key, since customers have to get their vehicles repaired as soon as possible, mechanics need to know the number of jobs they have lined up each day, and both groups require timely communications to ensure that the ClickMechanic platform is operating the way it should. In addition, SparkPost makes it easy for companies to quickly scale up their sending capabilities without having to pay more until they have to, rather than pre-paying for capacity they may not need yet. That’s important for a company like ClickMechanic, which is seeing growth by leaps and bounds as car owners discover the platform’s transparency and ease of use and mechanics learn that they can easily use the service to increase their revenue streams. Looking forward, Kenton says that ClickMechanic wants to do more with SparkPost beyond larger sending volumes. “We’re definitely keen to take advantage of the SparkPost API,” he explains, referencing SparkPost’s REST email API, which makes it easy to embed transactional email and analytics into any app or workflow. Given ClickMechanic’s heavy use of transactional email, the SparkPost API will offer them richer functionality when the company decides to implement it.